Odd Time Meltdown III takes a rock and fusion sensibility to deliver eight complete songwriting sessions in four different odd time signatures. A diverse compilation of odd meter drum loops that actually “groove”! 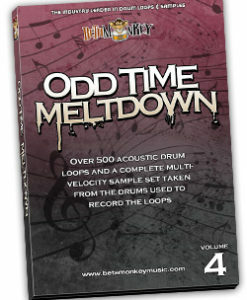 With Odd Time Meltdown III, we’ve developed a odd meter drum loops pack exclusively focused on time signatures that go beyond 4/4. It’s time to take your next songwriting project to another level and break free of common time. 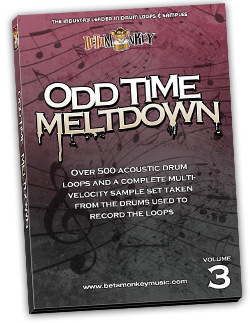 If you’re looking for musical drumming in odd meters, Odd Time Meltdown III is a powerfully diverse and versatile drum loops pack dedicated to taking your music beyond 4/4. These acoustic grooves are musical and natural, with a range of odd meter phrasings that will serve your drum tracks as as comfortably as as any typical 4/4 rhythm. With this loop library, Odd Time Meltdown III takes a rock and fusion sensibility to deliver eight complete songwriting sessions in four different odd time signatures. With over 370 grooves and fills, this collection of odd meter rhythms features one of L.A.’s top session drummers (translation: no quantization required!) knocking out grooves equally at home in prog-rock, fusion, rock, funk, pop, and hybrid styles, all in the odd time signatures of 3/4, 5/4, 7/4, and 7/8. All drums were recorded in a single tracking session for the ultimate in mixing and matching versatility. Want to combine a section of 3/4 with 5/4 or 7/4? You can combine whatever your music needs with over 1 GB of essential grooves that go outside the comforts of common time. With a focused tempo span between 50 bpm and 75 bpm, Odd Time Meltdown III features powerful and tasteful acoustic odd meter grooves captured in one of Los Angeles’s premier recording drum rooms that will give your drum tracks the human feel so lacking in competing MIDI and virtual drummer products. Focused Odd Meter Loop Sets: From spacious, wide-open grooves to subtly complex rhythms, Odd Time Meltdown III delivers an extensive collection of live acoustic odd time grooves in 3/4, 5/4, 7/4, and 7/8 time signatures. All loops are sonically compatible, allowing users to combine multiple odd meters and tempos. Musical Interpretation of Odd Meter Time Signatures: Musically-intelligent, versatile, and usable, all loops performed live by one of L.A.’s top session drummers on a Mapex maple drumkit in one of L.A.’s go-to drum rooms, Longer loops (2, 4, 8 bars and beyond) will enhance the realism of your next rock or fusion songwriting project – no one-bar “sounds like a loop” loops found on competing products. Cohesive Drum Mix: All drum loops are taken from a single drum tracking session. All grooves, fills, one shots, and drum samples are sonically-matched and allow users the ultimate flexibility in drum track construction. Want to mix time signatures or change tempos at will? With Odd Time Meltdown III, you can. One of the reason all Beta Monkey loop packs are the most versatile and used samples you’ll find anywhere. 592 (1.02 GB) original, royalty-free drum loops. 220 (209 MB) multi-velocity drum and cymbal samples. Available for instant download in 16/44 ACIDized WAV, 24/44 ACIDized WAV, 24/44 APPLE LOOPS, and REX2 formats. ALL loop formats available with purchase. Hard copy DVD also includes all available formats for a single purchase price. Need even more drum loops in odd time? Don’t forget the other members of the Odd Time Meltdown Series family: Odd Time Meltdown I, Odd Time Meltdown II, and Odd Time Meltdown IV. 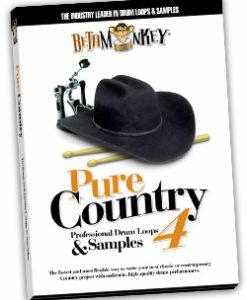 Dedicated collections of 3/4 and 6/8 time signatures also available in Drum Werks XXIV, Drum Werks XXV, and Pure Country IV (brushes).